FOR decades, your correspondent has watched, with more than casual interest, every new twist and turn in the quest for an “artificial leaf”. His hope has been that industry might one day replicate the photosynthetic process used by plants, and thus create forests of artificial trees for making hydrocarbon fuel direct from sunlight. Apart from helping offset the emission of carbon dioxide caused by burning fossil fuels, such man-made leaves could provide an endlessly supply of energy for transport. Finally, it seems, something is stirring in the forest. In his recent State of the Union address, President Obama drew special attention to the $122m research programme on artificial photosynthesis that is underway in laboratories across California. “They’re developing a way to turn sunlight and water into fuel for our cars,” said the 44th president. He might have added that the Joint Centre for Artificial Photosynthesis (JCAP), involving some 200 scientists and engineers from universities and research laboratories around the state, was seeking to make liquid hydrocarbons not from solar-powered electrolysis, biomass, micro-organisms or other round-about routes, but direct from sunlight—just as the chlorophyll in a leaf does. Sunlight is the world’s largest source of carbon-neutral power. In one hour, more energy from the sun strikes the Earth than all the energy consumed by humans in a year. Yet, solar energy, in the form of sustainable biomass, provides less than 1.5% of humanity’s energy needs. Meanwhile, solar panels contribute a mere 0.1% of electricity consumption. The problem is that the sun does not shine all the time. Night intervenes. So do clouds. If people are to rely on the sun for more of their energy, then a reliable form of storage is required. And the best way to store solar energy is to convert it into chemical fuel. That is what nature has been doing for millions of years. Unfortunately, artificial photosynthesis is still in its infancy. Researchers reckon that, at least in the laboratory, they can make fuel direct from sunlight far more efficiently than can the fastest-growing plants. But no-one can yet do so at a cost that would make the process economic. Nor can they make it robust enough to work continuously, year in and year out, under the full glare of the sun. And they are years away from integrating the various steps—from capturing the sunlight in the first place to producing the finished fuel—into working prototypes, let alone commercial-sized factories capable of producing something resembling petrol. Nevertheless, chlorophyll—the stuff of life—is as good a place as any to start. This large organic molecule has a magnesium ion at its core, surrounded by a ring of porphyrin. In nature, porphyrins are a group of organic pigments that give plants, corals and even animal skins their colours. One of the most common porphyrins is heme, the pigment in red blood cells. The porphyrin in chlorophyll absorbs strongly in the red and blue-violet parts of the visible spectrum, but not in the green. By reflecting such wavelengths, chlorophyll gives plants their colour. It would be better, of course, if chlorophyll could absorb light across the whole of the visible spectrum. But plants take what they have been given. As such, chlorophyll’s job is to absorb all the energy it can from sunlight, and use it to transform carbon dioxide from the atmosphere and water from the soil into carbohydrates and oxygen. The energy stored this way is what makes it possible for practically all living things to survive and thrive. What makes chlorophyll so good at capturing sunlight is the way its ring-like structure can lose and gain electrons easily. When a leaf absorbs photons from sunlight, electrons in the chlorophyll molecules get excited from lower energy states into higher ones, allowing them to migrate to other molecules. That forms the starting point for chains of electron transfers that end with electrons being "donated" to molecules of carbon dioxide. Meanwhile, the chlorophyll molecules that gave up electrons in the first place accept electrons from elsewhere. These form the end points of transfer processes that start with the removal of electrons from water. In this way, chlorophyll acts as a catalyst that drives the oxidation-reduction reaction between carbon dioxide and water to produce carbohydrates and oxygen. 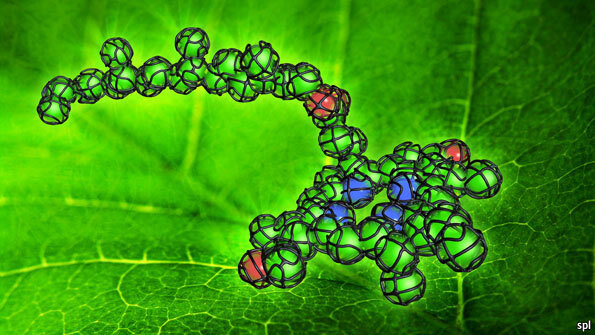 In the pursuit of the artificial leaf, then, the main task is to find catalysts that can mimic the intricate dance of electron transfers that chlorophyll makes possible. The JCAP programme, led by the California Institute of Technology in Pasadena in partnership with the Lawrence Berkeley National Laboratory near San Francisco, will run for five years. The goal is to demonstrate a working solar-fuel generator that uses no biological components and no pricy catalysts (like platinum), yet can produce hydrocarbon fuel from the sun ten times more efficiently than maize (corn), sugar cane, switch grass or any other fast-growing crop. To do so, the JCAP team will need to perfect a host of different components—including light absorbers and catalysts, molecular linkers to couple the two together, and special membranes for selectively separating the oxygen and hydrogen produced during the process. Two different catalysts are required: one to split water into hydrogen and oxygen; another to convert carbon dioxide and hydrogen into hydrocarbons. The various components for doing this will then need to be engineered into a practical bench-top system for demonstrating not only that solar fuel can be made efficiently and economically, but also that the process can be scaled up for commercial application. At present, the JCAP team uses a carpet-like structure of microfibres made of a silicon-based semiconductor similar to those employed in photovoltaic solar panels. But instead of generating electricity, the charge-carriers produced by the semiconductor drive the catalytic process for splitting water into hydrogen and oxygen. Special membranes vent the oxygen away, while collecting the hydrogen. Later, other catalysts will be used to convert carbon dioxide and hydrogen into basic fuels such as methane and methanol. Long-term, the goal is to make "drop-in" replacements for petrol, or even diesel. Before that can happen, however, cheap catalysts will have to be found. Platinum is excellent for splitting water into storable hydrogen and oxygen, but it is far too expensive to use on a commercial scale. A more practical substitute has been developed at the Massachusetts Institute of Technology, where Daniel Nocera and his colleagues have perfected cheap and durable catalysts based on cobalt and phosphate, and, more recently, on nickel and borate. Last year, Sun Catalytix, a Massachusetts-based company founded by Dr Nocera, was awarded a $4m contract by the Department of Energy to commercialise the process. The company aims to develop solar-fuel stations for places that are off the electricity grid, and eventually for the home. Meanwhile, the JCAP team in California is working on its own light absorbers and catalysts. So far, it has released few details—though it admits it needs to develop cheaper versions of what it is currently using. But the dark horse in the race to develop a synthetic chlorophyll could be a small group at Massey University in New Zealand. Wayne Campbell, at the university’s Nanomaterials Research Centre, has come up with a series of porphyrin dyes that work with solar cells based on titanium dioxide rather than silicon. In the laboratory, Dr Campbell’s cells are said to generate electricity for a tenth the price of conventional photovoltaic panels. There is talk of incorporating them into roofing materials and tinted windows. But if Dr Campbell’s porphyrin dyes are as efficient as claimed, they could prove to be better catalysts for producing solar fuel for motor cars, as well as electricity for homes. Your correspondent is gratified to see that artificial leaves are sprouting everywhere—and promising to make the world a greener place.